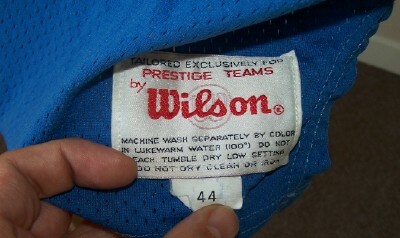 TOPIC: Distinguishing an early 1990s Wilson retail 'authentic' Lions jersey from those supplied to the team. 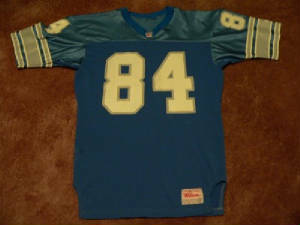 GAME WORN: I own eighteen game worn Lions jerseys manufactured by Wilson during 1991, 1992 and 1993. Every one of them has a 1/2" wide size tag. 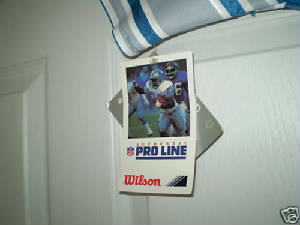 The 1991s (all but one) each have the 1/2" wide size tag affixed along the right side of the "Prestige Teams" tail tag. 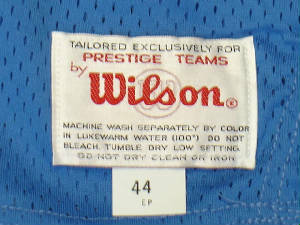 The remaining 1991, and all of the 1992s and 1993s, each have the 1/2" wide size tag affixed along the bottom of the "Prestige Teams" tail tag. Beneath each size tag is another 1/2" wide tag, bearing a two-letter, year and month date of manufacture code. Those with extra length have a third tag, 1" wide, indicating the extra length. 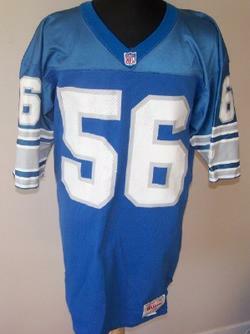 RETAIL AUTHENTIC: During this time, Wilson also manufactured authentic Lions jerseys for retail sale. These are similar in material and construction to those used by the team. 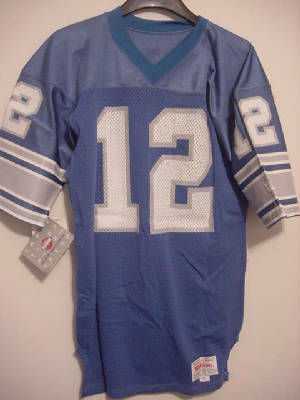 The screened-on numbers and sleeve stripes are identical. 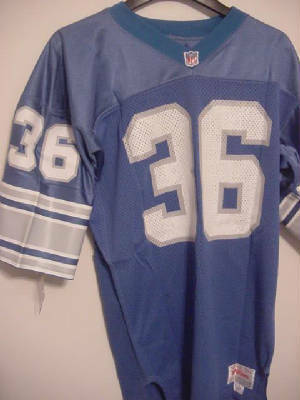 No names on back. These are distinguished by their tail and size tags. 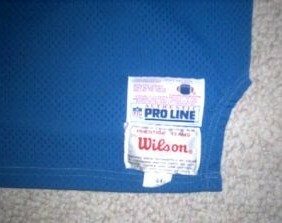 Every authentic I have seen has a 1" wide size tag, affixed (or in the case of the #84 - obviously removed from) along the bottom of the "Prestige Teams" tail tag. 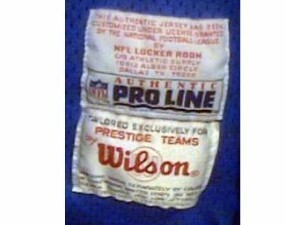 One type had "Pro Line" tail tags sewn above the "Prestige Teams" tail tag, as shown in the first two photos. These are easily identified as authentics. 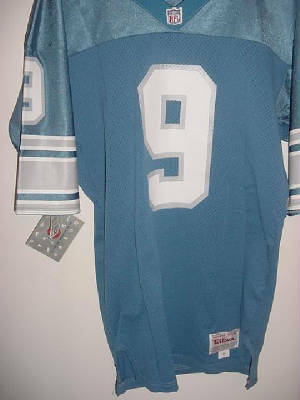 Another type -- without the "Pro Line" tail tags -- are shown in the rest of the photos. To date, I have seen these with numbers 9, 12, 36, 44, 54, 55, 56, 78 and 84. 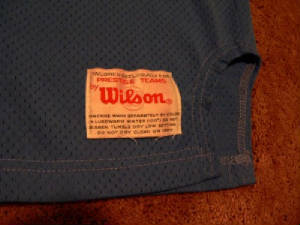 The numbers 9, 12, 36 and 55 pictured were found on ebay around 2002, in new conditon and with the retail tags still attached. 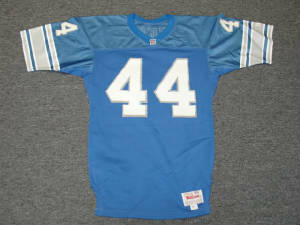 The number 44 was correctly listed on ebay in January 2007 as an authentic. 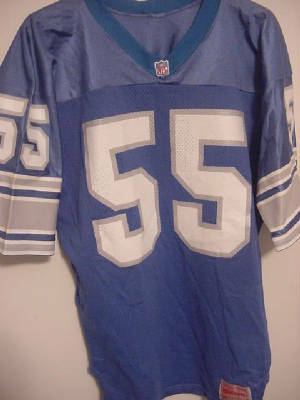 The number 56 was incorrectly listed on ebay in September 2008 as team issued, even though it has a retired number, and had no name on the back. 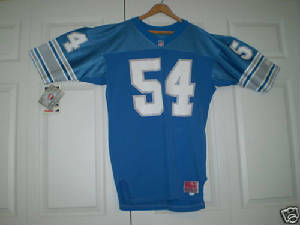 The number 54 was correctly listed on ebay in June 2009 as an authentic. 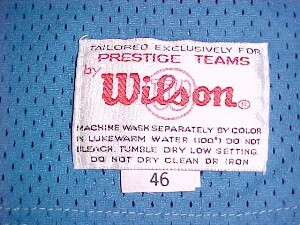 The number 84 was correctly listed on ebay in October 2011 as an authentic, but the 1" size tag had obviously been removed from along the bottom of the "Prestige Teams" tail tag. Note the loose white threads. 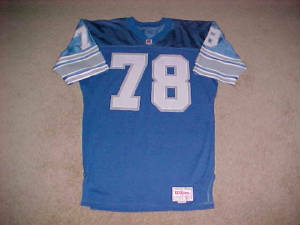 I purchased the # 78 new from a retail store around 2001. The manufacture date code has two letters followed by a hypen and number.